The Pew polling says Obama and McCain are tied. The New York Times is reporting that Bill Gwatney, the chairman of the Arkansas Democratic Party, was fatally shot in his office in Little Rockyesterday morning. We have no indication at this point that the killing was political in motivation. Indeed, my reading suggests that the guy was an employee at a car dealership belonging to Gwatney. Even money, though that by the time you read this, someone will have spun it into something political, though. At the very least we’ll hear all about gun control again. Oops. Too late. Gateway Pundit has a fair roundup. Here comes another Democrat DA who thinks he can use his office to quell dissenters. You know, I don’t think he’s read the book on this topic… I’m not sure he’s gonna like how this turns out. Seems to be a trend about Democrats and quelling dissent. This time, John Edwards is the topic. And of course should we forget Denver’s plans for dissenters of Democrats? And of course Pelosi gets into the act, threatening Lieberman. Apparently, it’s tow the line or else with these people. Article on Fox talking about Bird poop treatments for your face. OK, turn your nose up if you will, but do you know what’s in the makeup you already have on your dresser, hon? Better you don’t know. A fair amount of freedback to my swipe at Kurtz last night. About 50/50 by my read. Yes, I’m aware the guys been around for a while and is more educated than I. This is supposed to impress me? Far as I can see, it makes the offense worse, not more explainable, or defensable. I’ve been pleased with YetAnotherJohn’s posting. He’s putting up really great stuff, and is a fine addition to what was already an impressive team of writers, here, myself DavidL and Fersboo. I am as pleased with out collective output on this blog as I’ve been about anything in a long while. Camping maybe this weekend. At least a road trip down the Erie run. Supposed to be nice on Saturday. Wanna try and get a few more camping runs in before the end of the season. What would you do with a pound of cyanide? In Denver? Apparently this Canadian guy had an idea about that. He’s dead now, instead of his intended victims. His name? Saleman Abdirahman Dirie. The article in the Denver paper sugegsts the guy had a website though there seems some dispute if it’s his or not. I see Michelle has been following the story, too. Apparently being a progressive is whatever Obama says it is. Can I just say I’m unimpressed? Of course progressivism was always ill defined anyway. And ill advised, by my lights, but that’s another matter. And finally, what is the news of the latest problems in Denver? Is it that there’s not enough ‘natrual’ food? That the whole thing isn’t ‘green’ enough? That the people are using paper plates faster than any company picnic? No, turns out that those who would be our environmental saviors don’t have enough Limos to go around. Doesn’t that just say it all? Just think of all the greenhouse gasses. Oh, wait. These are Democrats… their limos don’t emit greenhouse gasses. The picture of the day is wishful thinking as much as anything. On the whole, my dear, I’d rather be camping. This one was taken at Lakeside Beach SP about 30 miles west of here, during a weekend stay there a few years ago. 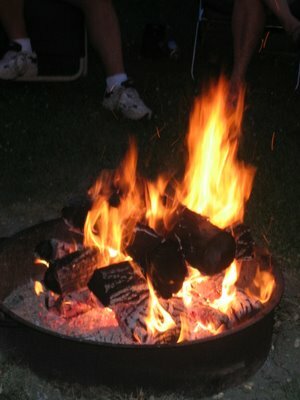 There is, I think, something about a campfire that is comforting in ways most people cannot describe. I’ve done a lot of camping over the years, and I don’t care how fancy your arrangements get, from pup tent to 40ft 5th wheel RV… if there’s no campfire, the place is incomplete. We’ve camped in 30 degree weather at times. We have a heated 21ft trailer. It’d be warmer to stay in the trailer. But somehow, you feel warmer still, sitting around a campfire. Strange, but true.